Note: Thanks to Netgalley and Random House for providing the ARC of this title. Okay, okay, I know the answers. Laziness, lack of interest, overschooling in a shoddy system and absentee parents cover most of my charges. But then I turn the question back on my own floundering attempts to gain some level of fluency in Mandarin. Why so many mental blocks when I’m so desperate to reach my goal? Why, despite my best efforts, does my brain seem so intent on jettisoning every new character, every grammatical construct I try to cram in there? In How We Learn (The Surprising Truth About When, Where, and Why It Happens), NYT science reporter Benedict Carey peers behind the brain’s curtain to uncover just what goes on during the process of education. Keenly aware of the ocean of folk wisdom and old wive’s tales surrounding learning and retention he attempts to separate the wheat from the chaff and come out with a working model which will be useful to students and teachers alike. The book kicks off with a brief, layman-friendly look at the neuroscience of learning. Without going into any scary detail, Carey gives us an enlightening tour of the physical mechanisms which come into play when trying to cram a new skill or set of dates into our crania. However, this is just by way of an introduction. Soon he gets on to the meat of the matter and the part in which most readers are doubtless interested: how do we make it work better? 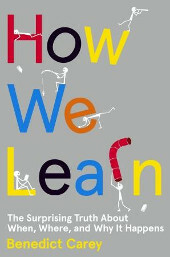 Much of How We Learn takes the form of holding pieces of time-worn ‘wisdom’ up to the harsh light of scientific study (padded by Carey’s own enthusiastic personal anecdotes for some light relief) and seeing how they hold up. Take routine for example. Everyone and their gran knows that if you want to get some serious learning done you sit yourself down in your learning chair, turn off the music and totally immerse yourself in exactly the same way you did the day before. Bzzzt! Wrong! It transpires that a lack of variety in the learning environment can actually be an impediment to successful retention and recall of information. In the real world we’re seldom going to be using the information we ingest in exactly the same environment or on the same schedule. Injecting variety into the study schedule acknowledges this fact and strengthens our ability to dredge the subject matter back up whenever we need it. And so it goes for myth after myth. It turns out that forgetting is actually good for you, strengthening the memory in a manner not unlike the tearing of muscle fibre being used to beef up the body. The repair system itself makes us stronger. Or what about cramming the night before an exam? Well, it does indeed work – in the short term. However, give it a few weeks and you’ll be struggling to even remember what was on the exam paper. What about doing your studies every day, simply pounding in those facts till they stay in place? Nope, spaced repetition is the key as any student who has attempted to use an online language learning tool will doubtless be aware. To Carey’s credit, How We Learn is scrupulously backed up with references. This isn’t some flimsy, new-age book – it’s all based in hard science and experimentation. However it’s presented in such a way as to make it both immediately accessible to those needing a boost in their study endeavours and deep enough to satisfy the curiosity of educators. I’m already working on ways to incorporate his findings and advice into my classes, boss’s approval pending. Definitely worth a read no matter which side of the educational fence you’re currently occupying. Seven long years ago, short on reading material and desperate for something new, I picked up a book entitled The Lies Of Locke Lamora. Pitched as a tale of thieves and con-men set in a dirty fantasy world it was far from my usual bag but by the end of the first chapter I was hooked. I burned through the book in record time, duly raved about it to anyone who would listen. The tales of the Gentleman Bastards lit a fire in me and I consumed the sequel, Red Seas Under Red Skies, with equal vigour as soon as it appeared the following year. The saga of Locke Lamora was scheduled to run for seven installments so I waited with baited breath for part three. And… nothing. Scott Lynch seemed to vanish from the face of the earth. Were the Gentleman Bastards abandoned? Had their creator vanished into some hole, fallen foul of an insurmountable case of writer’s block or some debilitating affliction or addiction? 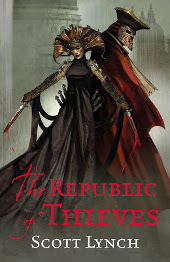 To be honest I’d written off any chance of seeing the third in the series until, a full six years later, a chance visit to NetGalley knocked me sideways – there, in front of me, was an uncorrected proof of The Republic Of Thieves, waiting for request and subsequent download! I’ll admit it was concerning as well as exhilarating; what caused the long absence, and would it result in a lesser work, a disappointing continuation? Well here’s the tl;dr – The Republic Of Thieves is probably the most enjoyable book I have read all year, raising it above some incredible competition. To avoid spoilers for those of you unfamiliar with the Gentleman Bastards I’ll keep the background information light. Locke Lamora is an orphaned child raised in a society of thieves to become the most accomplished trickster in all Camorr. Slight in form, he makes up for any physical disadvantage with an extraordinary intellect and cunning tempered with an impetuous streak and a knack for the most colourful of insults. Accompanied by his childhood friend Jean Tannen, Chewbacca to Locke’s Han Solo, they lie, cheat and steal their way through life in a vaguely honourable fashion along with their trusted gang, the aforementioned bastards. The Republic Of Thieves picks up where Red Seas Under Red Skies left off with Locke at death’s door due to a wicked poisoning, Jean caring for him and grieving for his own loss and the rest of the Gentleman Bastards long gone. Things look grim until a Bondsmagi appears and makes them an offer they can’t refuse. The mysterious and deadly Bondsmagi reside in the town of Karthain and, for reasons best known to them, make a game of the five-yearly elections held by the ‘normal’ residents. Two factions of the mages play off against each other, trying to influence the outcome in favour of their own candidate through the use of imported pawns whose remit is to use any means necessary (short of outright murder) to gain victory. In exchange for a cure – not to mention a pardon for killing one of the Bondsmagi in a previous adventure – Jean and Tannen are to fight in the corner of Patience, one of the highest standing mages. Little known to them their opponent has already been selected – Sabetha, Locke’s lifelong crush whose whereabouts have been unknown or the past five years. The result is a beautiful tale, an epic battle of wits as Locke and Sabetha run rings around each other while Locke struggles to contain his feelings for his old flame. Running parallel to the main plot is a secondary story told in flashbacks, a theatrical escapade from the Gentleman Bastards’ formative years, in which we witness the feelings between Locke and Sabetha beginning to unfold. It seems that six years away has managed to hone Lynch’s storytelling chops. Throughout the entire, and considerable, length of The Republic Of Thieves he barely puts a foot wrong. The pacing is perfect, alternating between plots at exactly the right points. His dialogue is a joy to read, particularly Locke’s biting sarcasm and Jean’s earthy retorts which I’m unfortunately not allowed to quote just yet. The tricks themselves are worth the price of admission, with the constant one-upmanship being reminiscent of Caine and Olivier’s shenanigans in Sleuth, albeit on a grander scale. And finally, I don’t know how he did it but there’s a moreishness to every chapter which actually had me disappointed when I reached the 500-page mark and realised that the end was in sight. There’s not much left to say really, this book was all set to disappoint me but instead it blew me away. I already want to go back and re-read the first two installments just to keep me afloat until part four (The Thorn Of Emberlain) arrives. Will this book have the same effect on you? Well, if you have any love for devious tricks, creative cursing, theatre and performances and well-written fantasy with a great deal of heart then there’s a good chance it will. Get acquainted with the Gentleman Bastards from the beginning then catch up with The Republic Of Thieves. You’ll be fantasising about your alternate life as the king (or queen) of the con artists in no time.